Immersed in rich history and mythology, Mathura and Vrindavan are the absolute best places to have the true Holi experience, one which you will remember for a lifetime. 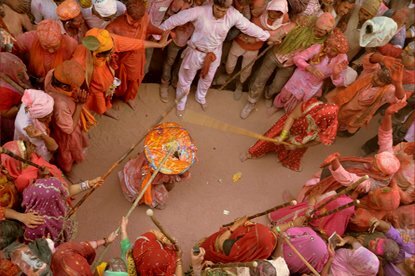 Festivities begin as early as two weeks before Holi in Mathura, the birthplace of Lord Krishna. Legends tell tales of how Lord Krishna and Radha's love blossomed in the suburbs of Mathura. 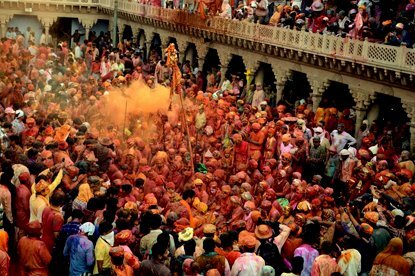 In fact, Mathura, Vrindavan, Barsana, Nandgaon and Govardhan are collectively called 'Brajbhoomi', with various forms of Holi being celebrated here. 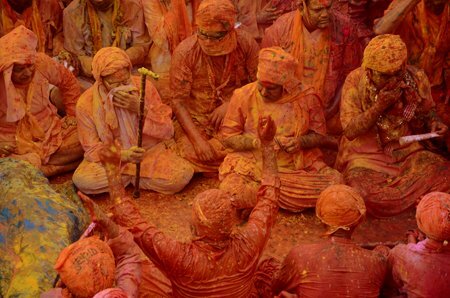 Celebrate the festivities with LathmarHoli, Phoolon-WaliHoli, apart from the main event in Vrindavan. "In Braj region celebration of Holi begins a week prior to Holi festival and continues a week after Holi. 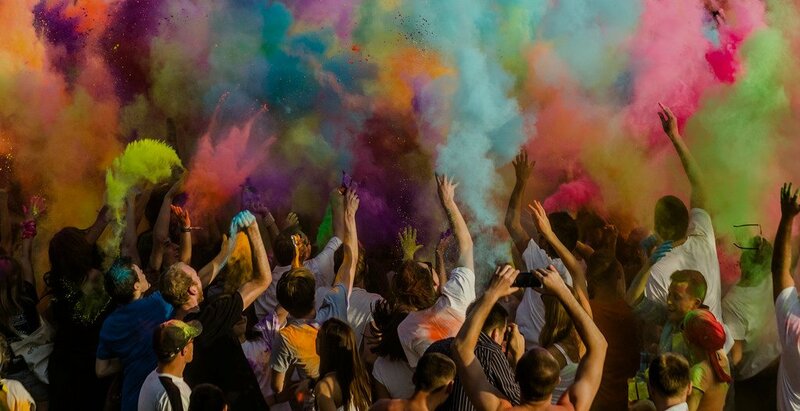 Long before water balloons and pichkaaris, Holi was only an idea- an idea that transpired to become one of the most amusing festivals of the world. Yes, Holi is the festival of colours. But what does colour symbolize here? We are never certain. But we always hope that colouring something gives life to it. And thereby, perhaps Holi is the celebration of life itself. Holi accolades life, love, its vitality, its passion. There are stories that date back the origin of Holi and recounts tales in mythology that trace the advent of our attempt at painting the human race more colourful. Maybe they are true, maybe they aren't. But the essence of colour compels us to shun our logical minds in the hope of a dreamy world full of rainbows. 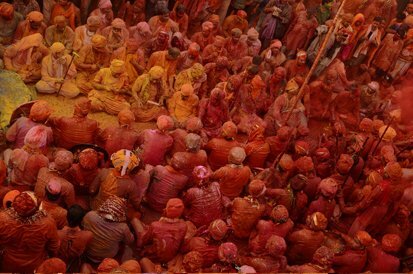 Today the famous lath mar Holi is celebrated in Barsana. Here, men from Nandgaon, the land of Krishna come to play Holi with the girls of Barsana and hope of raising their flag over ShriRadhikaji's temple. But, instead of colours they are greeted with sticks by the gopis. 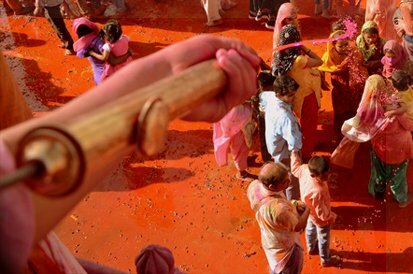 Hence, this Holi gets its name – LathmaarHoli. Smart enough, men come fully padded as they are fully aware what kind of welcome awaits them and also the fact that they are not allowed to retaliate on that day. In this mock battle of sorts, they try their best not to be captured. The unlucky one's however, are forcefully led away and get a good thrashing from the women. 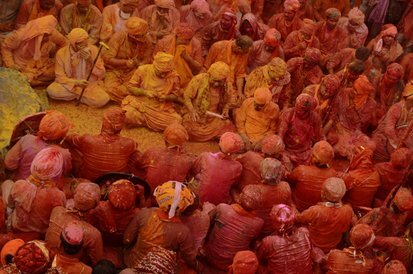 This day, Theholi festival will be celebrated at Vrindavan (11 kms from Mathura). The celebration at Banke-Bihari temple on this day is worth visiting. Here watch Hindu priests throw colored water and marigold garlands over the devotees, and feel the crowd surge forward to get a better glimpse of their beloved Lord Krishna. About 15 km of the south-east of Mathura connected by a metalled road is Gokul, a suburb of the inland town of Mahavan on the bank of the Yamuna. This is the town where infant Lord Krishna was brought up in secrecy by his foster mother Yashoda. Situated on the banks of the Yamuna, Gokul is frequented by pilgrims, especially during Janmashtami and Holi. 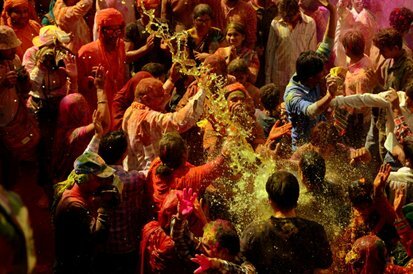 This day, Holi festival will be celebrated in Gokul. 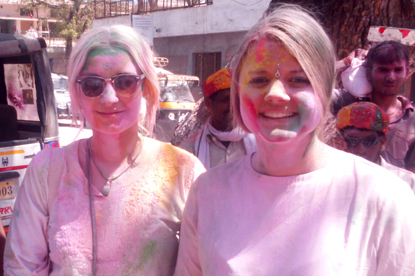 The Holi celebration at the Temple & streets of Vrindawan is worth visiting. 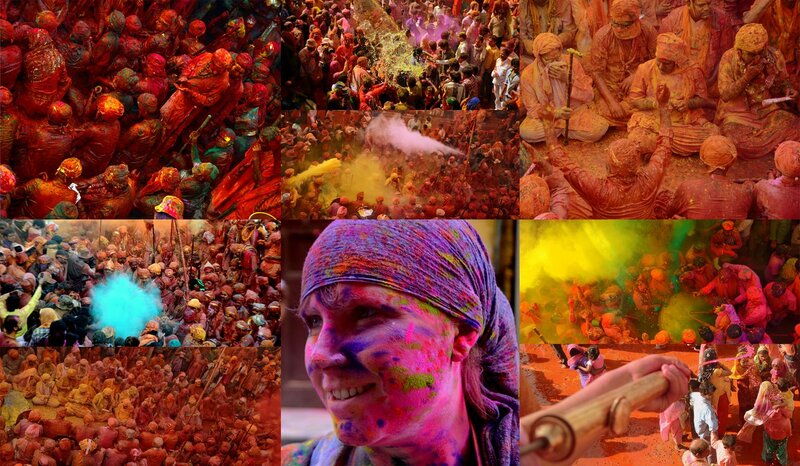 People from all over the country came to Vrindavan to celebrate Holi with their loving God Krishna. There is a special celebration takes place at Banke-Bihari temple on this day. 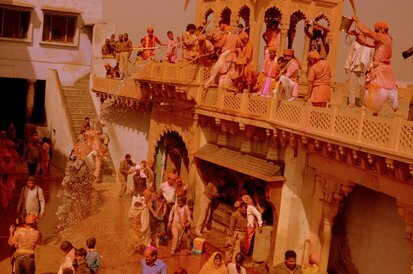 Here watch Hindu priests throw colored water and marigold garlands over the devotees, and feel the crowd surge forward to get a better glimpse of their beloved Lord Krishna. After the Holi festivities in Vrindavan get over around 2pm, head out to Mathura to participate in the colourful Holiporcession. The procession starts at VishramGhat and get over a little after the Holi Gate. Its best to catch it in the street connecting the two landmarks. 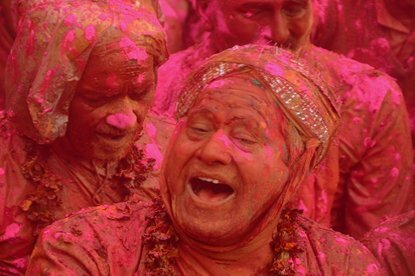 Holi is a Hindu spring festival in India, also known as the festival of colours or the festival of sharing love. The festival signifies the victory of good over evil, the arrival of spring, end of winter, and for many a festive day to meet others, play and laugh, forget and forgive, and repair broken relationships, and is also celebrated as a thanks giving for a good harvest. It lasts for two days starting on the Purnima (Full Moon day) falling in the BikramSambat Hindu Calendar month of Falgun, which falls somewhere between the end of February and the middle of March in the Gregorian calendar. 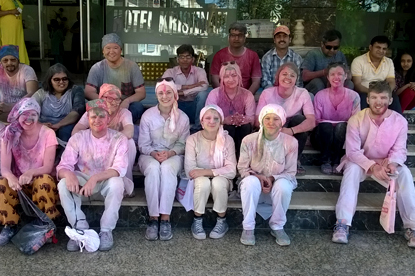 Holi Celebration at Baldev Temple (Dauji). As per the legend, Lord Krishna's elder brother Balram or DaujiMaharaj as he is affectionately called, used to rule this province around 12 km from Mathura. In his memory, the place is known as Baldeo or often, Dauji. 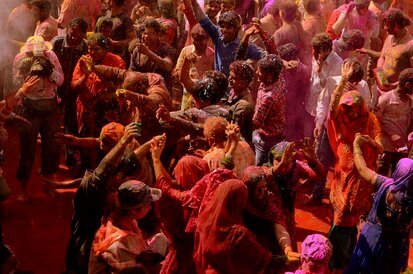 A day after the actual Holi, revelers look to DaujiMaharaj to continue the festivities as "Krishna has already left Mathura and returned to Dwarka". Dauji, in turn, obliges by becoming the center of the "Maharaas" in place of his brother Krishna. This is perhaps the only place in the world where the "raas" features someone other than Krishna.